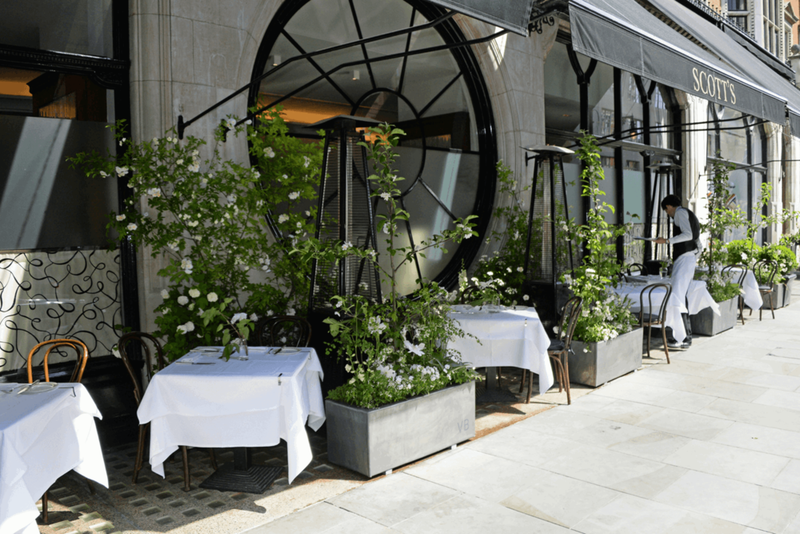 In an attempt to embrace summer, as so many others are so chirpily doing, I set about sourcing my favourite outdoor spaces for you to enjoy in Mayfair. Remember your factor 50, alluring sunnies, a positive holiday-esque demeanour and someone who will provide you with a solid 10/10 conversation in the sunshine. Hello endorphins! Bon appetit. Mews of Mayfair is loved by locals for providing brilliant pizzas in a unique hideaway setting, tucked away in one of London’s historic courtyards. There is a choice of different bars situated around the open courtyard, a first-floor brasserie and a pizzeria - what more could you possibly wish for? Enjoy the summer months at the 'May Fair In Bloom' terrace with a limited-edition range of bespoke floral-infused cocktails, including the Elderflower Rose Martini, Blueberry Blossom Spritz and Hibiscus Sangria. A great after work / date spot. Cocktails are £14 each. Four plates with a cocktail is £41 per person. The sun-filled, glass conservatory is home to fine Italian cuisine, breakfast, brunch, lunch, afternoon tea and dinner. The private and lush green garden terrace is open for urban, al-fresco dining during the summer months and provides guests and visitors with the perfect getaway from the hustle and bustle of the city. Good bye hectic taxi noises, hello garden bliss. Feeling quintessentially British? The Secret Garden is home to the Summer Sipping Sipsmith range, meat-packed pies and summer sunshine. The Windmill has teamed up with local distillery Sipsmith to use their award winning London Dry Gin for a collection of infusion cocktails; including delicious Sipsmith London Dry Gin infused with strawberries, raspberries and fresh basil. Open from midday, Scott's offers exceptional dining and cocktails. Watch the world go by on Mayfair's Mount Street as you experience fine traditional fish, shellfish dishes and variety of meat and seasonal game favourites. Oysters served at the oyster and Champagne bar are a house speciality. Cigar lovers can enjoy the outdoor area at Boisdale Mayfair after indulging with some excellent British tapas, seafood, burgers and more. The Cigar Terrace is traditional and comfortable with cushions and rugs, accommodating up to 28 guests at a time and offering a great selection of Cuban cigars available from the humidor. The iconic courtyard at Hush has been transported into a South American idyll, in partnership with Rooster Rojo Tequila, the fast-growing premium tequila created in the spirit’s authentic home: Jalisco, Mexico. 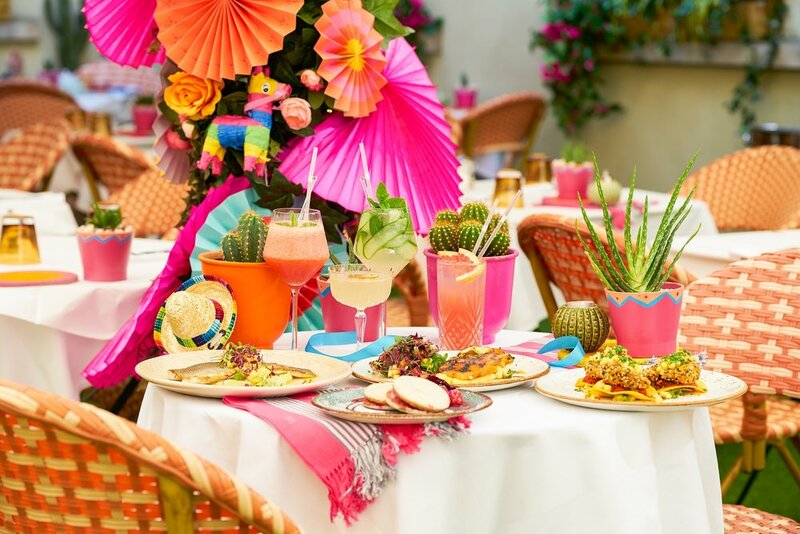 There's a vibrant archway, a canopy-covered courtyard, coloured pom pom hanging garlands, bright bursts of blooms and hand crafted colourful fans. 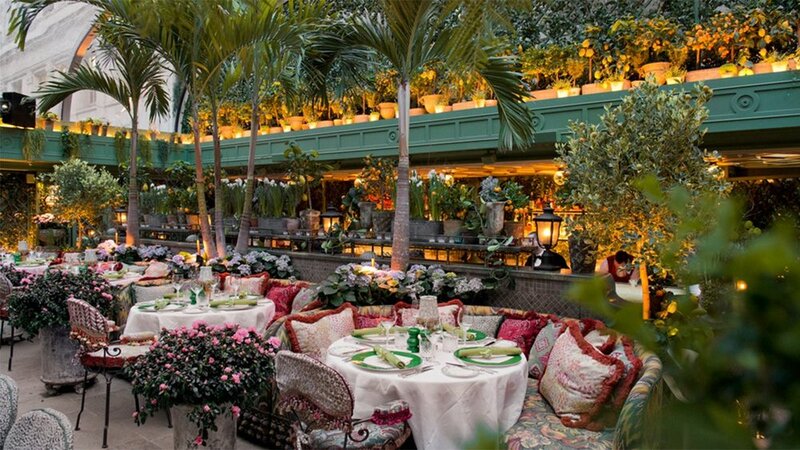 Members and hotel guests can enjoy the truly beautiful terrace at The Arts Club on Dover Street, alongside world class hospitality, cocktails and cuisine. March & White have applied their wonderfully distinctive aesthetic signature to this charming garden and it is utterly irresistible. Described as 'the beating heart of Annabel's' is a stunning, spectacular, secluded Garden, covered by a masterpiece in engineering, a one-of-a-kind retractable glass roof by steel architects, Waagner Biro. Members can dine out under the sun and stars all year round, seven days a week, for breakfast, lunch, dinner and late night drinks. Galvin at The Athenaeum is the hotel’s restaurant from Michelin-starred London chefs Chris and Jeff Galvin. 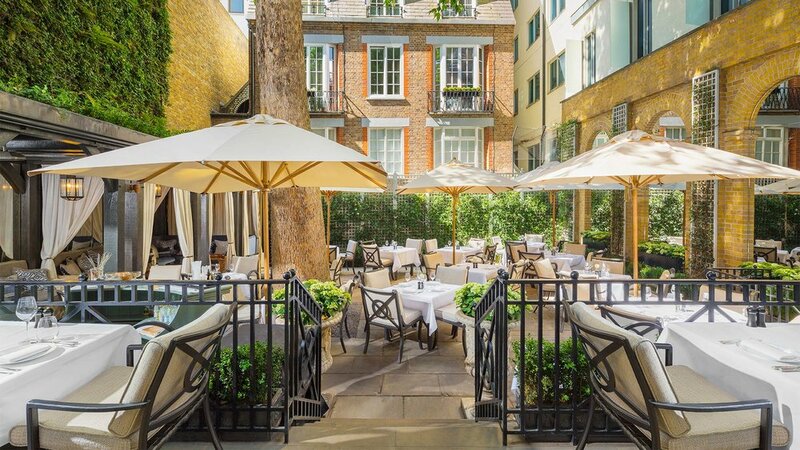 You can enjoy a seasonal all day menu on The Terrace at The Athenaeum all year round in one of the largest areas to socialise, eat or drink ‘al fresco’ in the heart of Mayfair, right opposite Green Park. Open 8am to 10.30pm.